MEI have long been media partners for the ALTA series of conferences, one of the world’s premier annual metallurgical events, now in its 24th year, and are pleased to be involved once again in 2019. 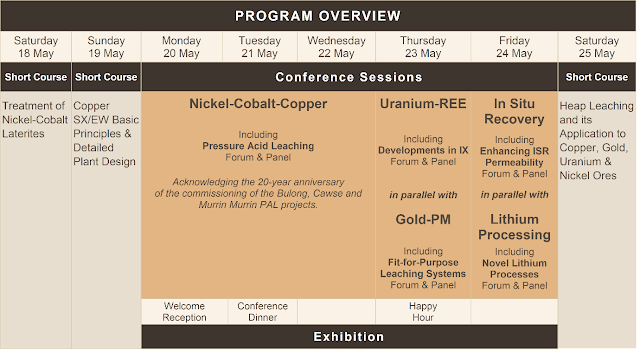 ALTA 2019 is a world-class annual metallurgical conference now in its 24th year, and a leading platform for innovation. The emphasis of the program is practical and the themes running through the conference are the various aspects of technology and project development. We are pleased to partner with CSIRO Minerals for In Situ Recovery and Curtin Gold Technology Group for Gold-PM. ALTA conferences are well-known for providing exceptional opportunities for the industry to share ideas, innovations, technologies and projects. Presenters receive 50% off registration fees. Sole consultant presenters receive 75% off registration fees. Submit your abstract early to secure your place in the program. The ALTA Free Library includes proceedings from 1995-2016 Nickel-Cobalt-Copper, Uranium-REE and Gold-PM conferences (1350+ papers). A selection of ALTA 2018 and ALTA 2017 papers is also available. The library is expanded regularly, providing a valuable ongoing resource to the industry.